Mohawk hairstyles for men have been enjoying commercial fame since the first half of the 20th century. The unmistakable hairstyle was introduced to pop culture in 1939, through the movie Drums Along the Mohawk. Nowadays, mohawk hairstyles for men are still as popular as ever. Check out some options below to see which is the best for you. 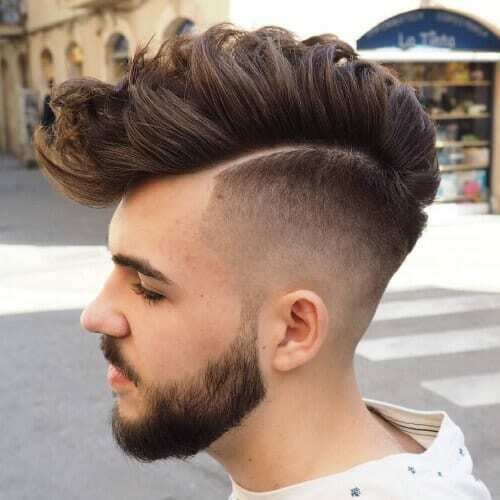 If you’re looking for balance among mohawk hairstyles for men, this is one of the best choices for you. The haircut has just enough class and attitude to be styled for both informal and formal occasions. 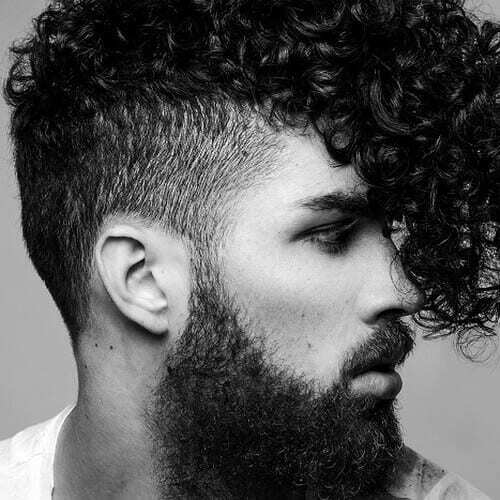 Men with naturally curly hair can always opt for a hairstyle like this one. The bangs are left long, about nose-length, while the sides are cleanly shaved down. It looks exceptional both with or without facial hair. 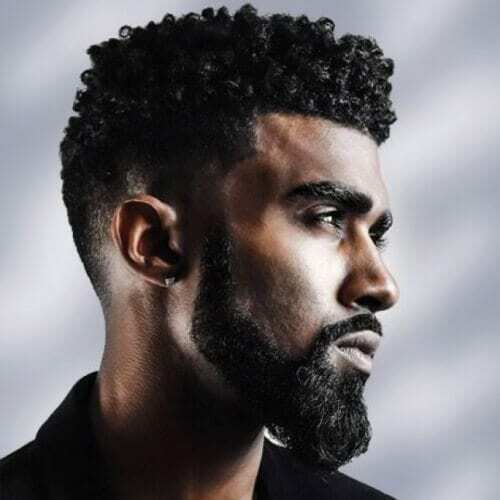 A great deal of afro-textured mohawk hairstyles for men involve faded sides. In many cases, they resemble the flat top hairstyle with variations. 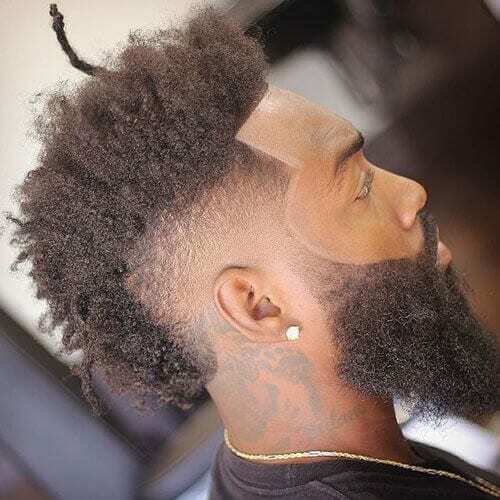 In this case, the afro top is defined by faded sides and a beard with similar length. Make your mohawk even more eye-catching with the help of a bold color. 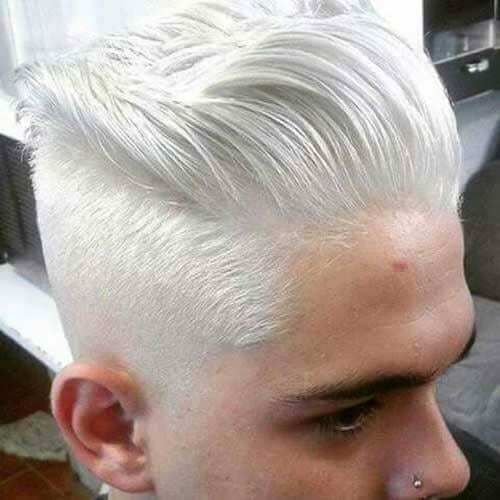 Bleaching your newly cut hair can make it stand out even more, regardless of your desired style. Either keep it laid back like this or go all up with spikes. If you have a really long mohawk, you can always experiment with styling. 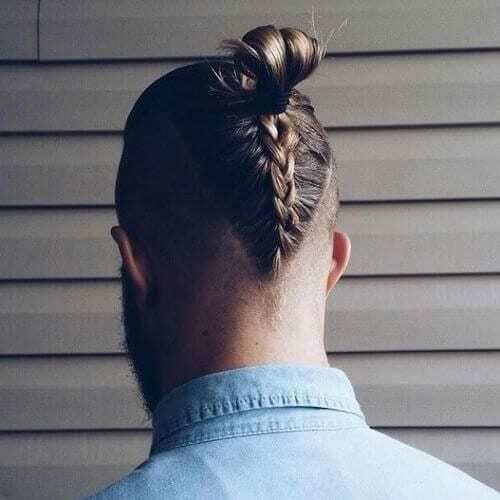 For instance, you can get inspired by this reverse braid that ends in a man bun if you want a semi-formal look. David Beckham is easily one of the most recognizable faces in soccer. Still, the athlete is also famed for his rebellious hairstyles, such as this faux mohawk (or fohawk). While the shape resembles a mohawk, it’s gently faded without complete shaving. If you prefer just to shave down the sides a little, you can take advantage of the opportunity by trying out different colors. For instance, you can dye the top part a striking shade, while leaving the sides your natural hair color. A mohawk can also be tailored to everyday situations. If you want to maintain a respectable look that is appropriate for school or work, this is the approach you should take. It can also be styled in various ways, either straight down the back or to a side. Long hair can benefit from a refreshing touch with the help of a mohawk. While shoulder-length hair might be difficult to style into a classic spiked mohawk, it can be swept back with both sides shaved. Beards and mohawks easily go hand in hand. 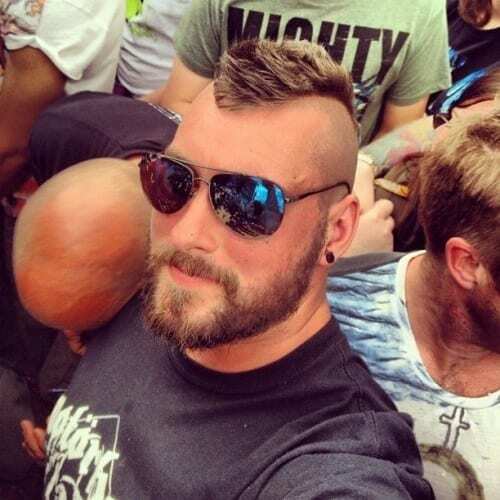 In fact, a full beard like the one in the image above is complemented by a sleek mohawk. 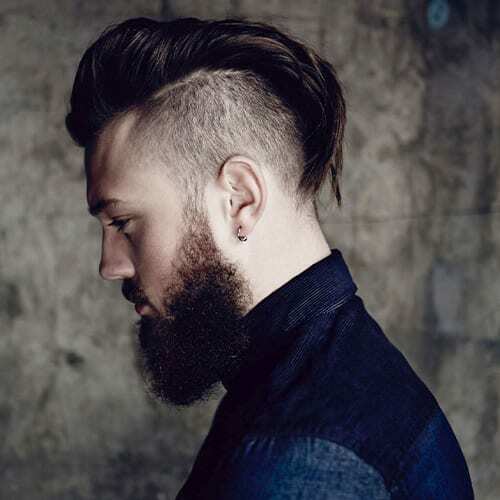 For this look, we recommend a shorter mohawk with faded sides. 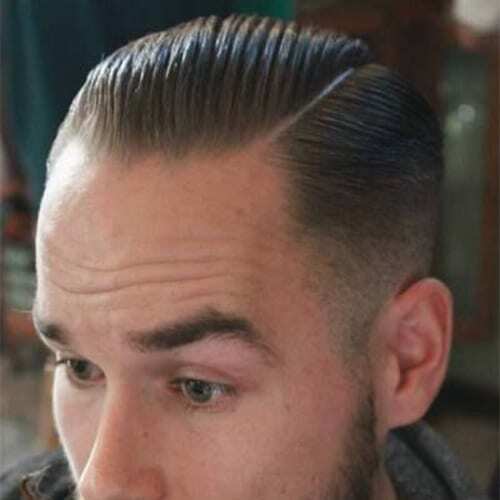 Short mohawks can also be outlined by maintaining a wide strip of hair in the middle. 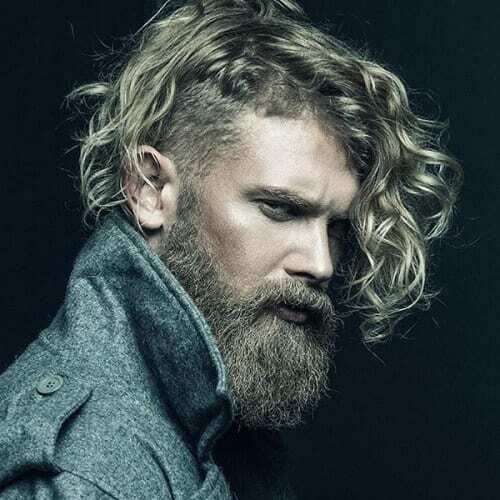 While this look is a bit more rough and edgy, it can be grown out with ease in whichever way you’d like. For a rugged yet fashionable outcome, you can go for this effortlessly stylish look. The key is maintaining the top part long, as well as the beard. It works especially well for men with wavy or curly hair. This is yet another way to sport a clean-cut mohawk. 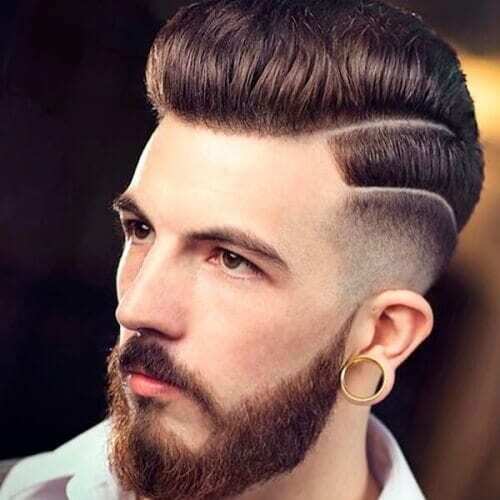 The trimmed beard is optional, but the secret to nailing the look is the faded undercut. Likewise, it can be worn with ease in business environments. 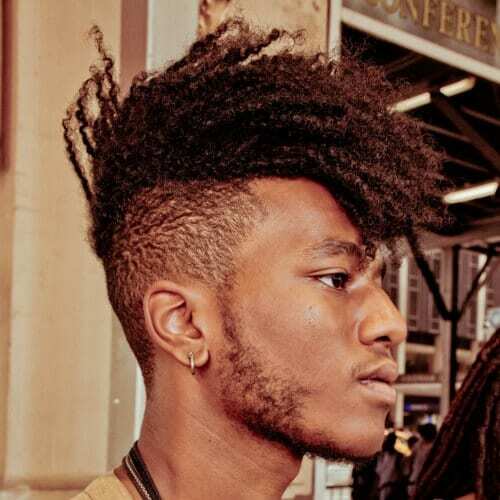 Faded mohawks also work exceptionally well for men with afro-textured hair. The fade will have an all more natural appeal, owing to the texture of the hair. 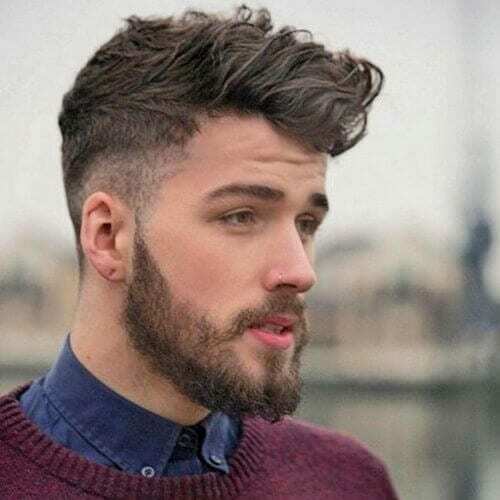 Pair the hairstyle with a moustache or beard, according to your preferences. 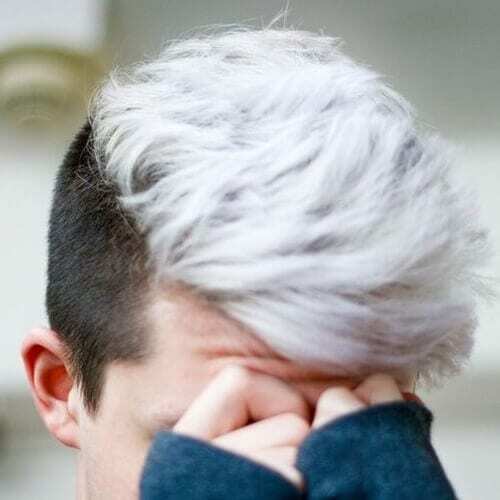 Another alternative is to completely shave the sides of your head, leaving a barely visible amount of hair. 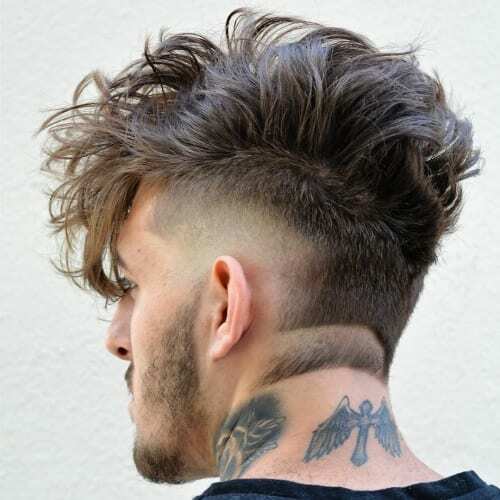 Shaved side hairstyles can be adapted to different personalities and styles, from a gentleman approach to a fully grown mohawk for rebellious men. If dapper is your style, this is the mohawk for you. The elegant hairstyle features a handsome pompadour and a fine undercut, all neatly trimmed. This is the perfect combination for the polished man. Having short hair doesn’t mean that you can’t rock a mohawk. Quite the contrary, you can mold it into an aristocratic hairstyle, regardless of your age. For men over 40, it is an amazing way to mix suave and manly. No matter if you are indeed a college student or you just want to adopt a fresh and athletic look, this is an attractive way to do so. 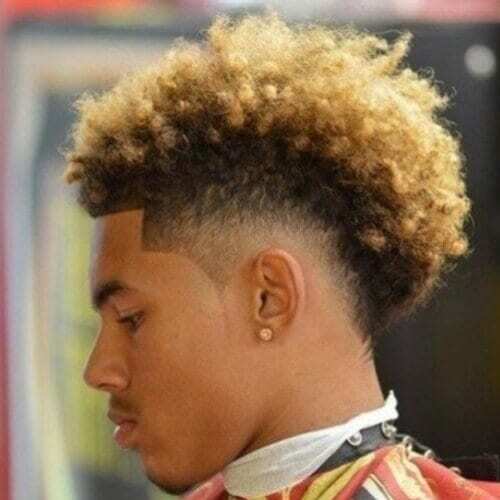 While not a traditional mohawk, this charming style has a forever young vibe that works admirably for young men. This example reinforces the idea of being young, wild and free. 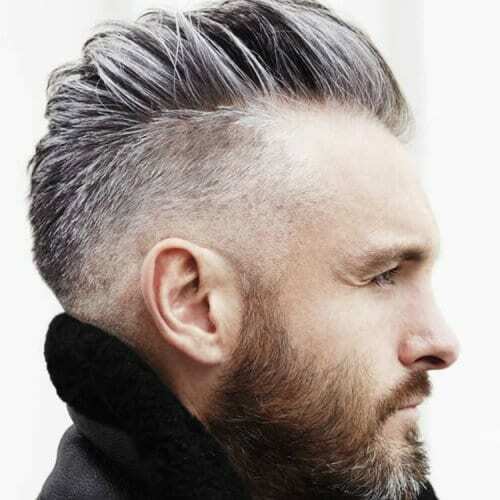 It might not be the typical look for a mohawk, but the results are captivating and attractive. 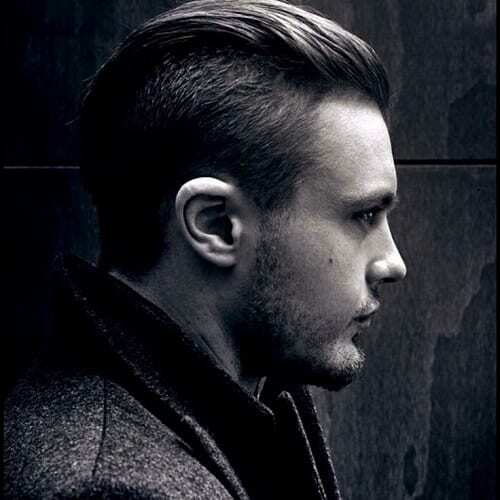 This stylish long haircut can be rocked by men who grew out their hair and want to give it a twist. Alluring is an understatement when it comes to hairstyles like these. This smart cut is among the optimum choices for office work, especially in a corporate environment. It’s also ideal for men who appreciate refinement. Nevertheless, that doesn’t mean that punk hairstyles aren’t brilliant for men with this kind of personality. In the end, it all comes down to the attitude and how representative the hairstyle is for your tastes. 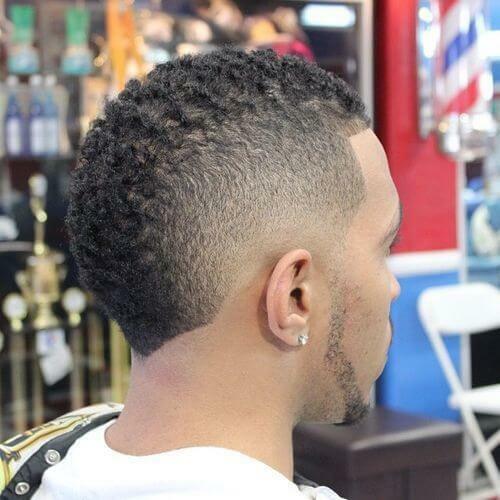 This example is among the Mohawk hairstyles for African American men that are flattering for all features. 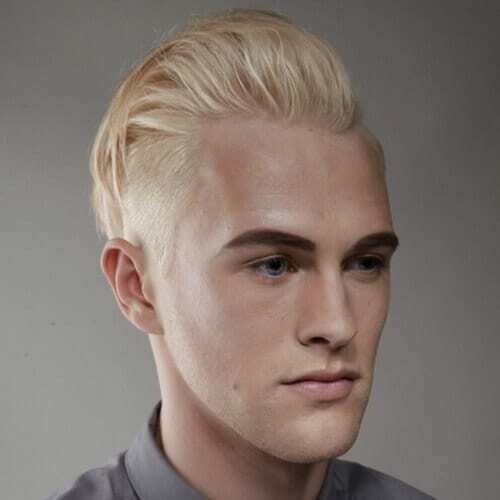 Similar to many others, it is inspired by the classic flat top, with long curls and a sharp shaved design. This afro-textured mohawk hairstyle can also be shaped for other hair textures. The wide strip of hair that goes from top to bottom smoothly fades into shaved sides, all with a cleanly shaved outline. If you want an impressive impact with a sleek mohawk, this is the hairstyle for you. The fetching look is highlighted by the slicked back top, perfect for fancy occasions or an edgy yet elegant look. 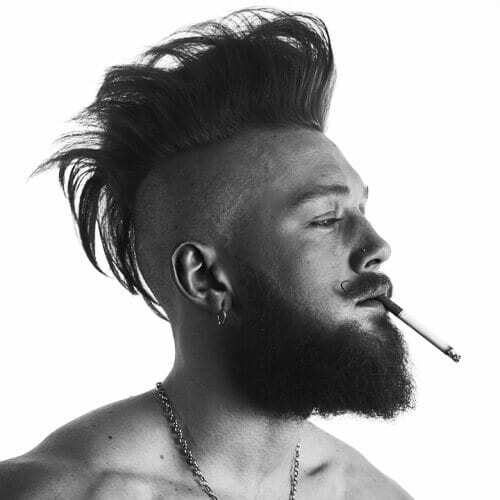 You’ll often find mohawks associated with beards, but they look just as remarkable with moustaches. 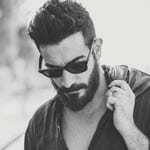 The rockabilly-inspired look is topped off with a well-groomed moustache and a properly trimmed beard. Full afros can also be tastefully styled with the help of a mohawk. This haircut not only offers shape and volume but it also contours the all-around look flawlessly. Consider adding another color to boost the dynamism. 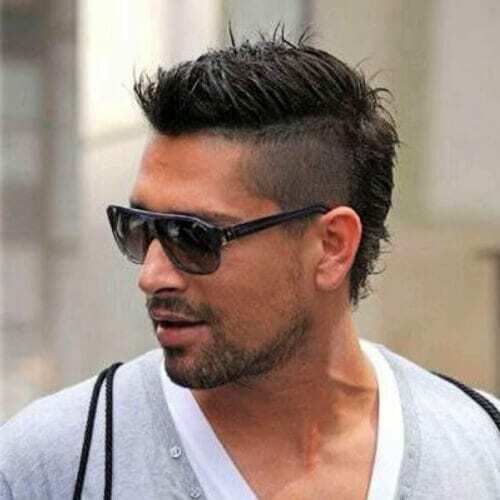 Italian soccer player Marco Borriello reminds us how an athletic mohawk can blend different styles harmoniously. While this is more than enough edge provided by the nature of the hairstyle, it also provides a stately appearance. 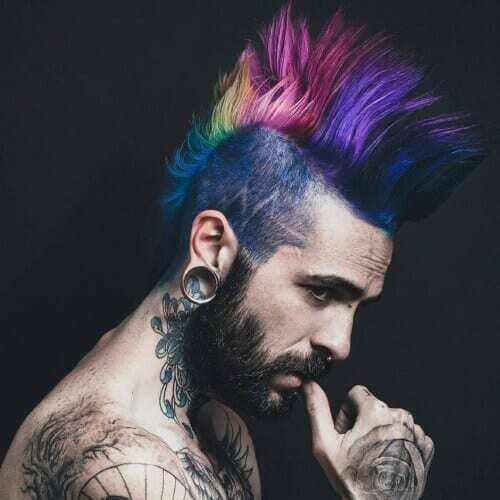 If you’re not afraid to experiment, you can always try out vivid colors for the top part of your mohawk. Whether it be purple, blue red or any other shade, a splash of color can bring the whole look to life. Although mohawks are usually destined for adults, that doesn’t mean that boys can’t sport them astoundingly. 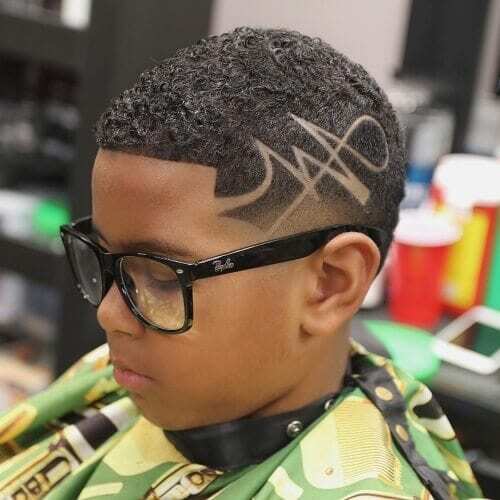 For instance, this young man chose an intricate, abstract shaved design that shows his outgoing personality. Even the shortest of hair can enjoy a mohawk-inspired haircut. 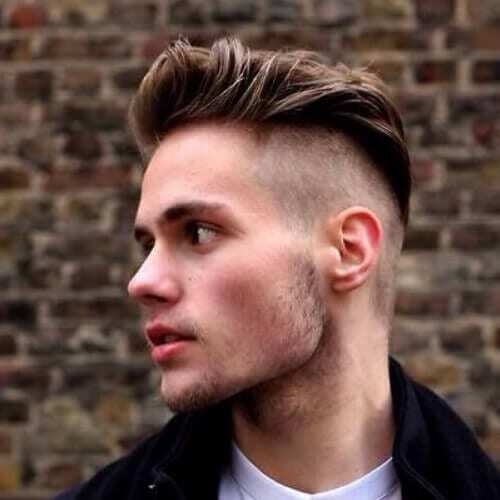 This buzz cut style is outlined by an excellent faded undercut, showing style and nice tastes simultaneously. 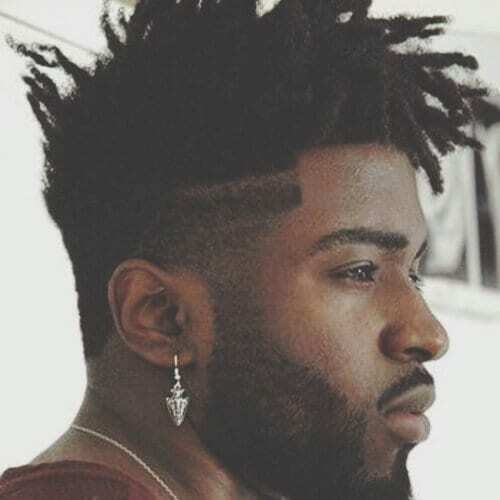 Regardless if you have shorter or waist-length dreadlocks, you can make the whole hairstyle even more interesting with a mohawk. The long locks and shaved sides allow you to style your hair in an abundance of ways. A hairstyle like this one is the definition of cool. 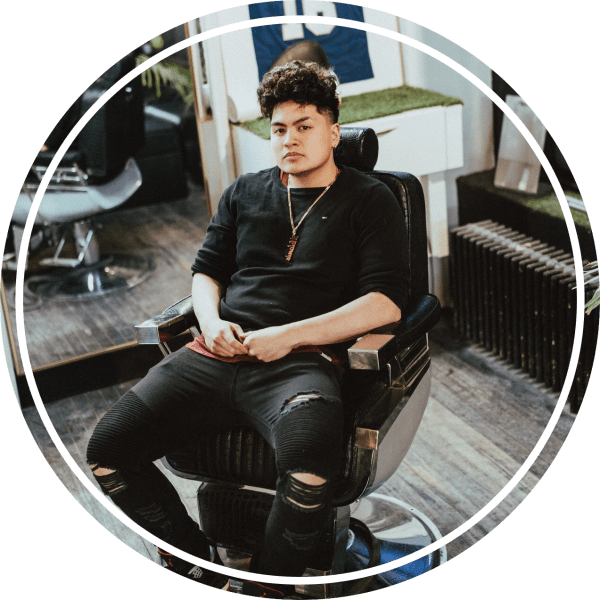 While it’s recommended that you get it if your hair is naturally thick, it can also be styled like this with the help of a quality hair product. When shaving the sides, consider getting a faded transition. Layers play a major role in contouring a mohawk. They make it far easier to style in different ways, whether it be to the side or directly up. 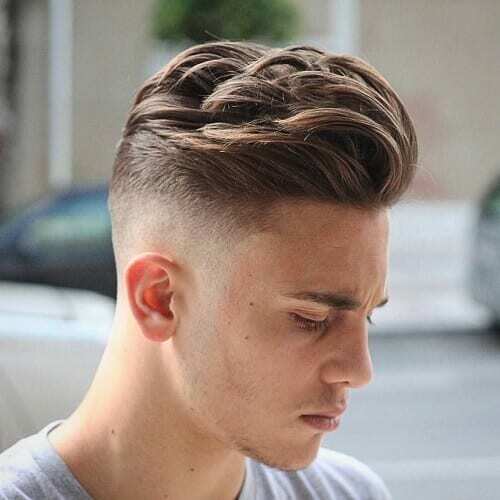 This is the perfect solution for men with long hair that want this haircut. 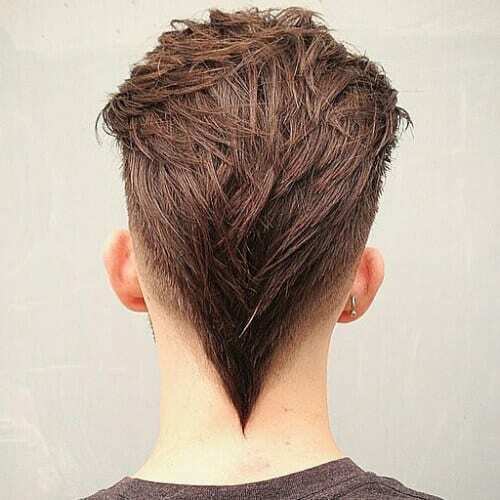 Another excellent way to outline a mohawk is with a V-shaped design. 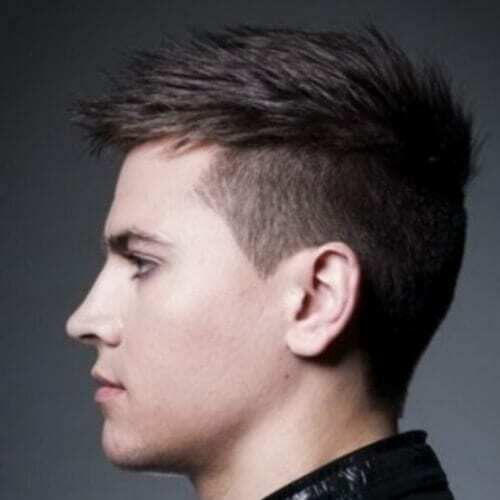 Shaping the back part in this way allows multiple styling, especially if your haircut contains layers as well. 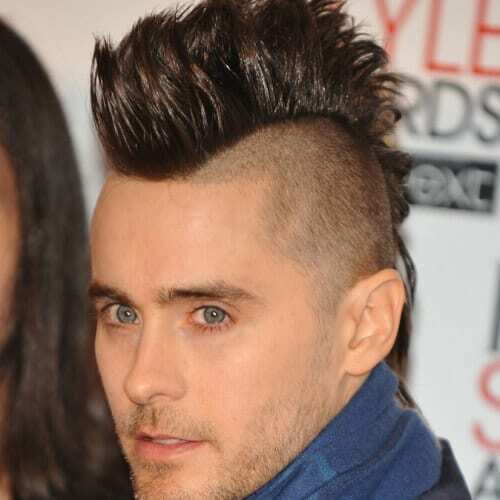 A few years ago, Jared Leto was almost synonymous with the idea of a mohawk. The singer, actor, and director shows how memorable a wide mohawk can be. This is particularly good-looking for men that have oval, long or diamond-shaped faces. 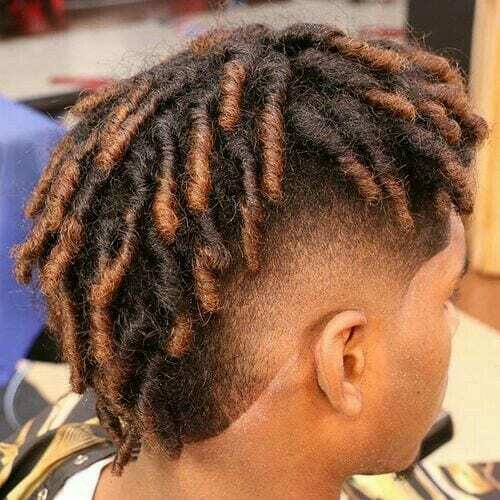 African American men with longer, finger coil curls can show them off with a mohawk-like haircut. 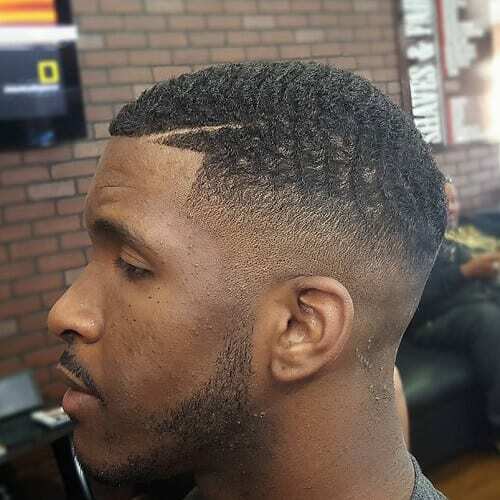 If you’re considering this type of hairstyle, speak to your barber about cutting your hair at an angle which can help your curls fall towards the front. 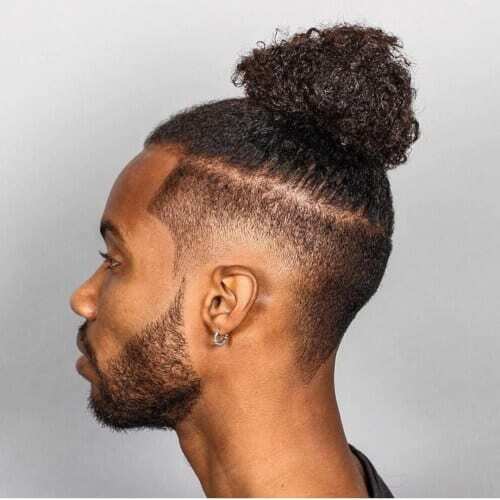 In terms of business casual hairstyles, here is another solution for having a mohawk kind of hairstyle that will be acceptable for work. There are no completely shaved sides, while the top is lightly styled with a few frontal spikes. Similar to dreadlocks, box braids look awesome with a mohawk or large undercut. It’s a fantastic idea for men with long braids, as they can wrap them up or let them cover the sides at their leisure. A mohawk with longer hair is obviously more generous when it comes to styling options. This stunning look is obtained with just enough hair product and patience for styling, as well as a well-executed haircut. 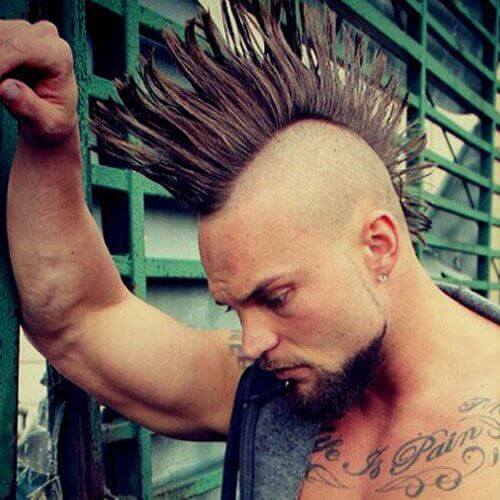 If you’re not afraid of an imposing look, you can go wild with colors for your mohawk. Not everyone will be up for having bright colors in their hair, but it’s quite the extraordinary look for those who feel it is representative of them. You can also play around with the shaved part of your mohawk. Try getting two layers of shaving done, with or without an additional shaved line. After that, it’s all in your attitude. 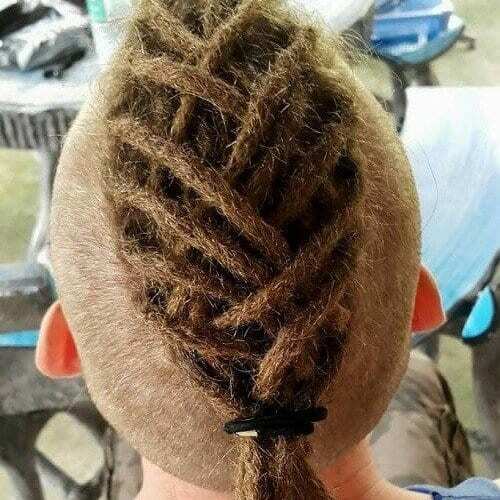 Like we previously stated, dreadlocks work astonishingly well with mohawks. 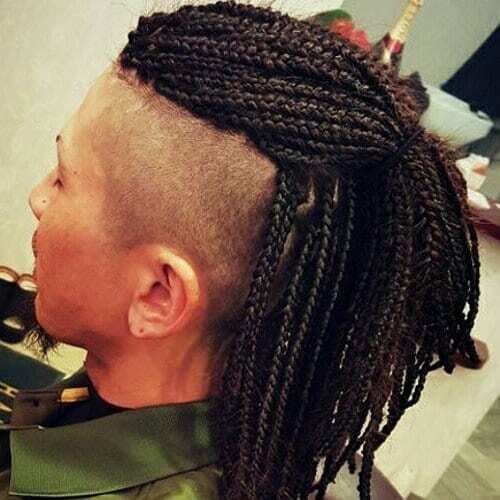 As our first example was with long locks, this one shows how shorter dreadlocks can also look really cool. Also, consider a unique styling choice like in the above photo. 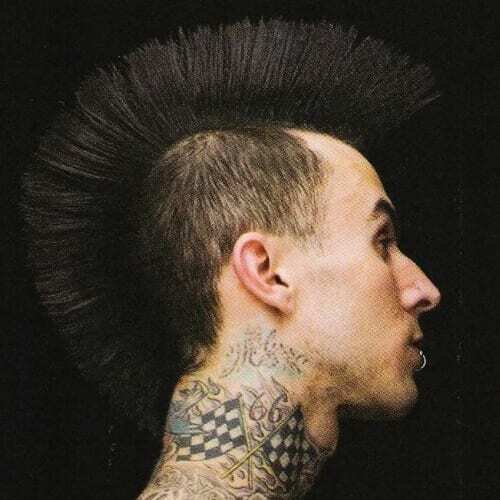 Travis Barker is yet another mohawk icon. The renowned drummer can be often found with a classic punk mohawk, perfectly executed. It’s a bold statement, but it’s ideal for his rebellious personality. Aside from bright colors, you can also go into other nuances. For example, silver platinum might be an option for you, to make the whole look stand out from the crowd. 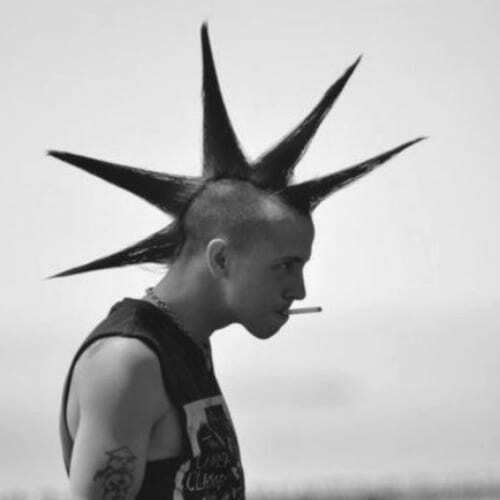 The fanned mohawk is commonly associated with punk culture. It is, indeed, a firm statement of your beliefs and lifestyle, so go for it if you were born to be wild. Liberty spikes are another example of a classic mohawk, but styled differently. The prominent spikes are the key part of the hairstyle, especially if you dye them in an eye-catching color. Just like the aforementioned example, it’s perfect for those with a punk lifestyle. Top knots have been increasingly gaining popularity among hair trends in the past year. One of the reasons is that they are highly practical for those with longer locks. If you like keeping your hair up, get an ample undercut and wrap the rest in a knot. For the modern vintage look, a mohawk with long hair is just what you need. If your hair has a fine texture, all you have to do is toss it to the side without worrying about other types of styling. 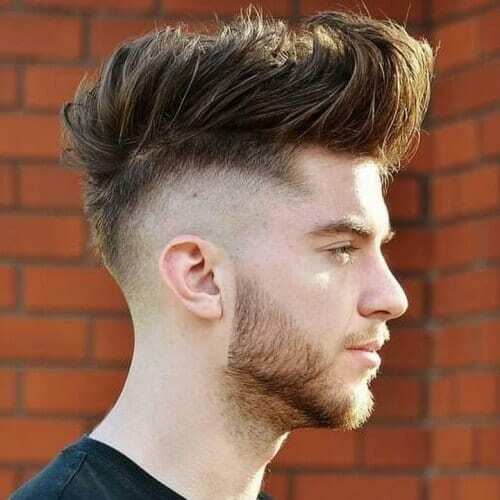 Alternatively, style your long hair upwards for a swept up mohawk. 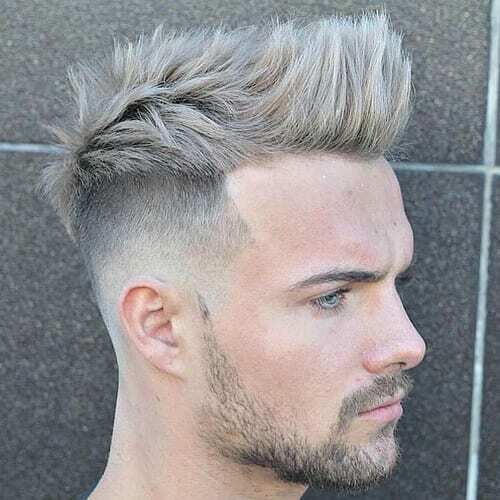 The high fade ensures a pleasant gradient from your long hair to the shaved sides. 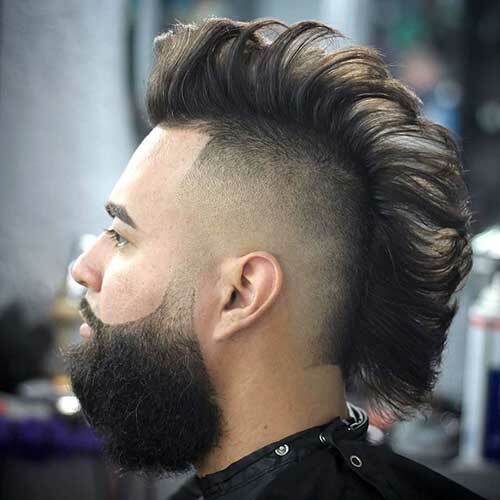 In addition, you can get creative with your barber when it comes to designing your mohawk. 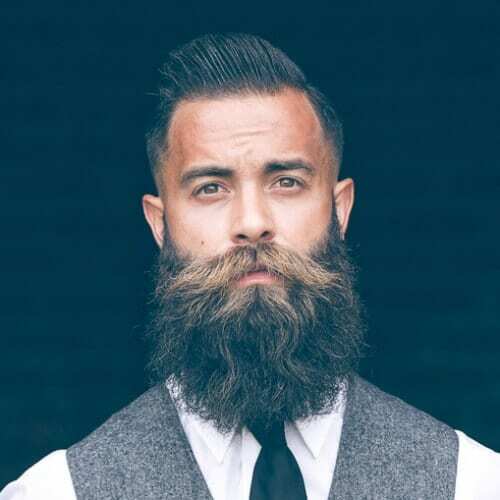 Fine details like perfectly curved lines or a well-defined beard shape can make the look unforgettable. 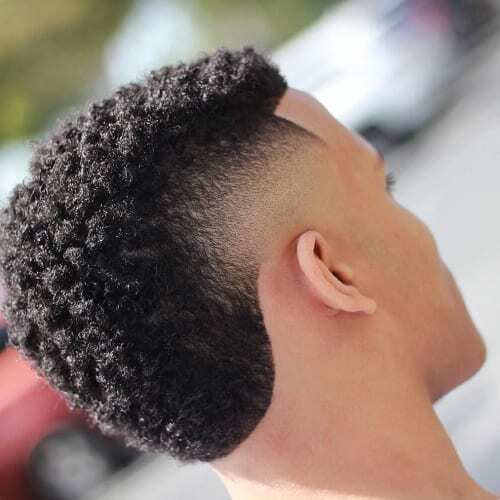 As far as mohawk hairstyles for black men are concerned, the burst fade haircut is definitely one to remember. 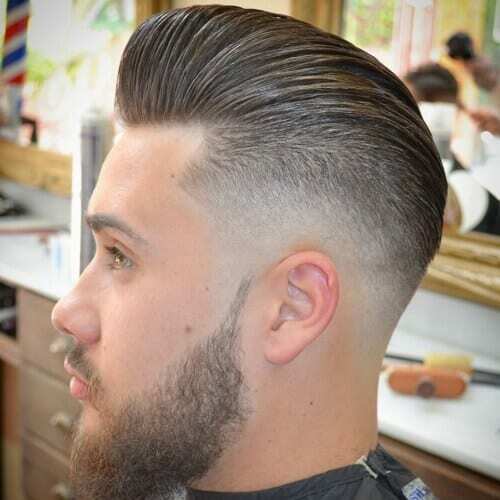 Also known as the South of France haircut, the burst fade gets its name from the way the sides are trimmed. If you have any tattoos on your head, a mohawk hairstyle is just what you need for emphasizing them. 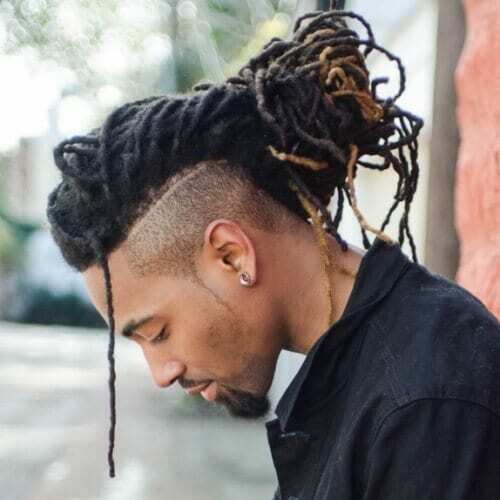 You can either rock a mohawk with long dreads, like in the photo above, or one with shorter hair, depending on your personality. 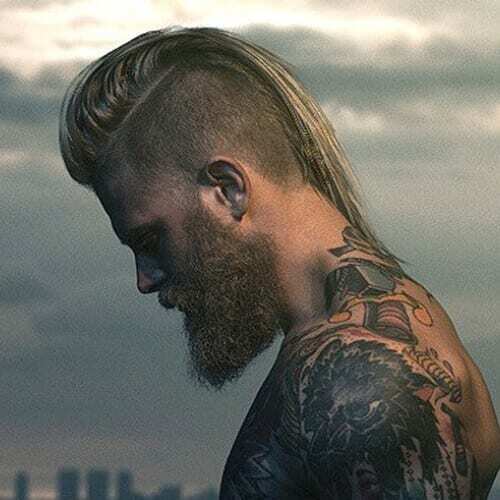 We’ve talked about mohawk hairstyles for men with V shapes in the back, but what about the other way around? You can sport a front V-shaped mohawk just as well and look awesome. We recommend the idea to men who want to focus on the way their hair frames their face. Still, you can play around with the back of your mohawk as much as you’d like. 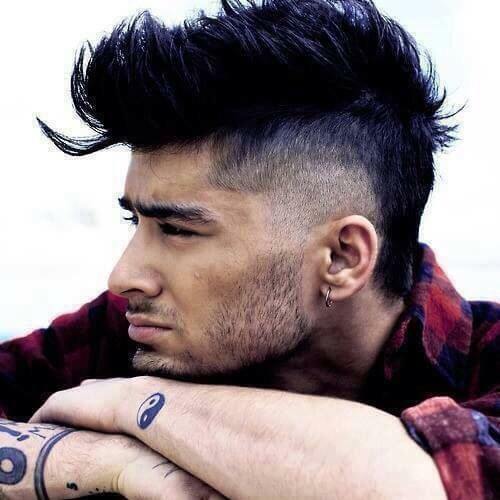 For example, you can get a shaved design on your name for a dramatic hairstyle. If you choose this version, make sure your mohawk doesn’t extend all the way to the back of your neck. Finally, here’s a cool way you can incorporate color into your mohawk hairstyle. If you have short dreads, you can dye them halfway through in your favorite color. Go for a natural tone, like the deep copper above, or a brighter shade of red, blue or green. All in all, mohawk hairstyles for men are plentiful and fit for all types of personalities. No matter if you have a punk lifestyle or you’re a businessman that wants a bit of edge with their hairstyle, a mohawk can work for you. To personalize the look, spend some time talking to your barber about the right approach for your preferences.